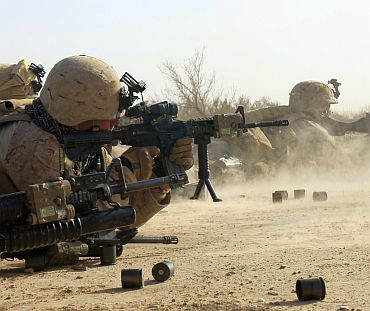 In the first major military confrontation since US President Barack Obama ordered the deployment of an additional 30,000 US troops late last year attack, thousands of American, Afghan and British troops are battling the Taliban in Helmand province of Afghanistan. Moving by land and through the air, the foreign troops are seeking to destroy the Taliban's largest haven in a bid to reassert the dominance of the Afghan government across a large arc of southern Afghanistan. 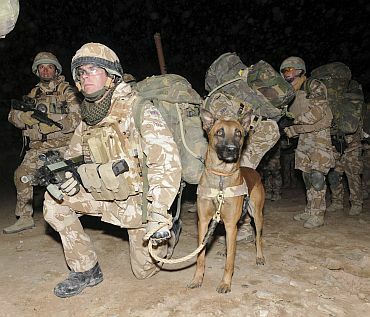 As the troops began to fan out on searches in the watery Taliban fortress of Marja, fighting with Taliban insurgents grew in frequency and intensity across a wide area, the pattern suggested that the hardest fighting lay in the days to come. The New York Times quoted American commanders as saying that the troops had achieved every first-day objective. That included advancing into the city itself and seizing intersections, government buildings and one of the city's main bazaars in the centre of town. 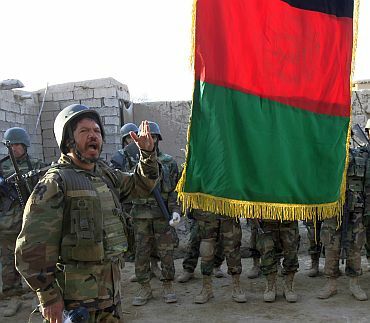 Mohammed Dawood Ahmadi, a spokesman for Helmand Province's governor, said Afghan and NATO forces had set up 11 outposts across Marja and two in the neighboring town of Nad Ali. "We now occupy all the strategic points in the area," he said. From those posts, Marines and soldiers began to go on patrols, searching door to door for weapons and fighters. Dozens, if not hundreds, of insurgents probably fled Marja in the days leading up to the assault, according to military officers and local residents. "Actually, the resistance is not there. Based on our intelligence reports, some of the Taliban have left the area. But we still expected there to be several hundred. Just yesterday, we received reports that reinforcements had arrived from neighbouring provinces," Abdul Rahim Wardak, the Afghan defence minister, said in a news conference in Kabul. But it seems likely that many Taliban were still in Marja, lying in wait. One resident interviewed by telephone said that many insurgents had stayed behind. "I don't have any information on the Taliban, neither where they are nor where they have gone. I don't think they have gone anywhere, because Marja has been surrounded by Afghan and foreign forces on every side," said Palawan, a farmer in Marja. The force of about 6,000 Marines and soldiers, a majority of them Afghan, began moving into the city and environs before dawn on Saturday morning. As Marines and soldiers marched into the area, several hundred more swooped out of the sky in helicopters into Marja itself. Marines from Company K, Third Battalion, Sixth Marines, landed near an intersection of two main roads at the northern fringes of Marja, piled out of the their helicopters and scattered into the houses and compounds around them. In the quiet dark of 2:40 am on Saturday, Company K met no resistance. But none of the Marines believed the peace would last the night. "Basically, we are going into a hornet's nest," the paper quoted Captain Joshua P Biggers, Company K's commander, as saying. Just after midnight, aircraft bombed the southernmost portion of Marja, where officials believed foreign fighters were hiding. 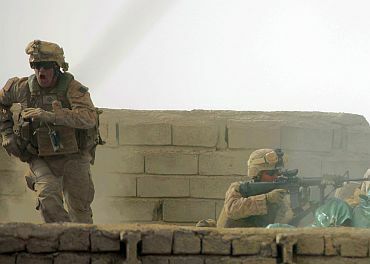 Later, Marines and Afghan soldiers began setting up cordons to the northeast, south and west of the city, in anticipation of a ground assault that was expected to begin within hours. 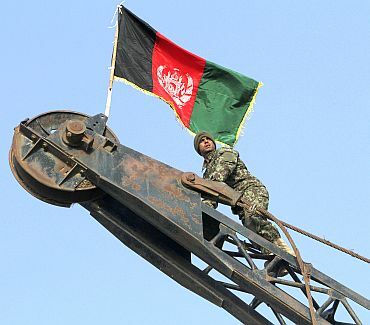 The operation, dubbed Moshtrarak, which means "together" in Dari, is the largest offensive military operation since the American-led coalition invaded the country in 2001. Its aim to flush the Taliban out of an area -- about 75 square miles -- where insurgents have been staging attacks, building bombs and processing the opium that pays for their war. The invasion of Marja is being touted as a crucial part of a larger campaign to secure a 200-mile arc that would bisect the major cities in Helmand and Kandahar Provinces, where the Taliban are the strongest. That campaign, which is expected to last months, is designed to reverse the Taliban's momentum, which has accelerated over the past several years. The troops that came in by air carried portable footbridges and mine detectors. The troops moving in on armored personnel carriers were being led by enormous fortified vehicles designed to clear road of bombs. 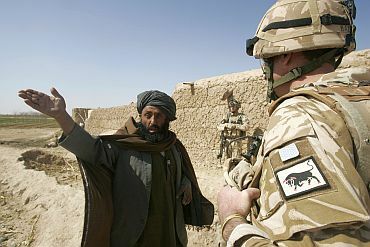 American and Afghan commanders say the overriding purpose of the campaign will take shape, when they bring in a fully formed Afghan government and security force that can hold the city so that the Taliban cannot return. Several hundred Taliban fighters are believed to be inside the city as well, which could make for a close and bloody fight. Despite that, the NATO and Afghan attackers appear to enjoy a huge numerical advantage -- possibly more than 10 to 1. The assault came as a surprise to no one. 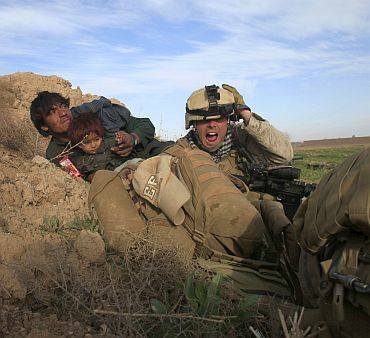 American commanders and Afghan officials have said publicly for weeks that an invasion of Marja was imminent, in an effort to chase away as many Taliban fighters as possible and keep the fighting, and civilian casualties, to a minimum. The centerpiece of the Marja operation is the Afghan government-in-waiting that will move into the town the moment the shooting stops. That is an attempt to compensate for past failures, when an inadequate government was left behind. "We've got a government in a box, ready to roll in," top American commander Gen Stanley A McChrystal was quoted as saying in Kabul. "The population is not the enemy. 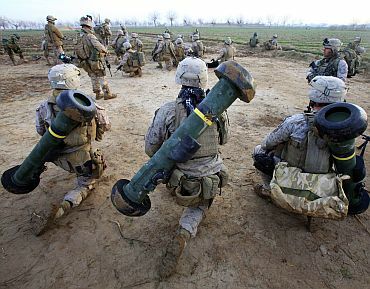 The population is the prize -- they are why we are going in," Brig Gen. Larry Nicholson, the commander of the Marines in southern Afghanistan, told a group of troops this week.